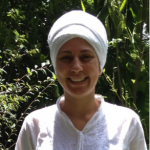 Kundalini Yoga instructor certified by KRI since 2015. Reiki therapist, Bach Flower Practitioner, Radiesthesia and Feng Shui practitioner. Undergraduate student of Naturopathic Medicine.